Sri Rama Navami is a festival to celebrate the birth of Lord Rama. 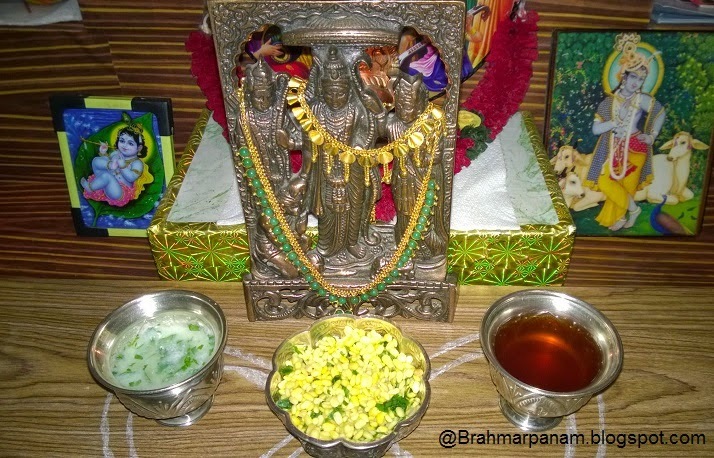 As an offering to Sri Rama, the prasad made on this day are Panagam, Neer moru, Vadaparippu. Dissolve the jaggery in water and strain it. Add the other ingredients and stir well and offer it to the Lord. Mix the yogurt and the water with a hand blender or stirrer. Soak moong dal in water for 30mins. Add the remaining ingredients and mix well and serve to the Lord. Hi, nice to see special festive recipes. I would just add some lemon juice to the panagam in addition to what you have mentioned.